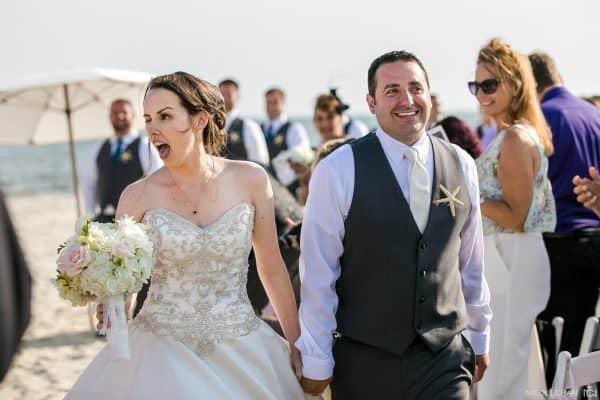 Wychmere Beach Club, of Longwood Events, boasts as one of Cape Cod’s premier beach venues – with multiple options for both indoor and outdoor weddings. It spreads across 20 acres along Nantucket Sound and includes lots of indoor spaces (my favorites are below) with a private beach, tennis club, boat dock, swimming pools, and exclusive guest rooms. One must be a member to enjoy these amenities, but many of my couples have been able to splurge during their wedding day weekend. Private beach – Sometimes that I’ve always disliked about beach weddings was onlookers. I spend lots of time making sure to frame my images correctly so that a giant man in a speedo isn’t photobombing my couples’ wedding. Wychmere has taken care of this fear for me by offering a secluded, private beach – perfect for clambakes, bonfires, and white soft sand for beach wedding ceremonies. It hosts a pretty large guest count, too: 320 guests for the beach ceremony and 500 for a beach clambake. Hydrangea room – A classic waterfront room right on the Cape with a beautiful lawn full of… yes, you guessed it, hydrangeas. I love the sliding glass doors and easy access to the patio! Its capacity is 150 guests for dinner and 200 guests for reception. Awesome things to note about this room is that you could potentially arrive to your wedding reception by BOAT! Ocean room – This is a larger ballroom that seats 200 guests for dinner, 300 for reception. Described as “nautical chic”, this room shows off a glorious wrap-around balcony, elegant Italian chandeliers, and a pretty fireplace. Harbor Room – It’s like a postcard. Sailboats. Seagulls. Docks. The Harbor Room is a perfect Cape Cod wedding venue because of it’s access to pictureque Cape Cod and also it’s history! The room is build on an original dock and features lots of “Cape elements” – sailcloth drapes, driftwood floors (AWESOME COLOR) and that crisp ocean smell. It holds 500 guests for reception and 320 guests for dinner.